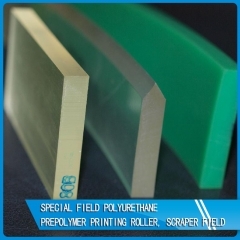 Description Printing roller, screen printing scraper Key features Can be used for organic solvents, such as esters, toluene, printing ink, water-based ink, ketones, etc. Typical properties Special field SPF-561 SPF-562 SPF-563 Prepolymer Appearance (25℃) Waxy solid viscous liquid Waxy solid NCO Content(%) 2.4~2.6 3.0~3.5 3.0~3.5 Using Mixture Ratio (PHR) 6.9~7.5 7.1~8.3 7.1~8.3 Life in the Reaction Kettle (75~78℃/min) 5~7 5~7 5~7 Physical Properties of Finished Products Hardness (Shore D) 65±5 75±5 85±5 Tensile Strength (MPa) 28.7 38.2 39.5 Tearing Strength (kN/m) 35.9 67.5 56.4 Elongation at Break (%) 498 710 231 TOL/EA/CYC Mixed Solvent 24h Expansion Rate（%） ﹢15 ﹢9 ﹢5 Application Mainly used in the production of various kinds of printing roller, screen printing scraper, etc. Usage method Can be used for manual, some products are more suitable for the operation of pouring machine, chain extender are MOCA, E-300, BDO or special chain extender. Attention The prepolymer should be stored at low temperature and dry place, avoid the moisture and moisture when used After the opening of the prepolymer should be used up as soon as possible, if not exhausted with nitrogen seal. The storage period of unopened prepolymer is three months. If you want to add color paste or other materials, keep the water content below 0.1%, and consider the compatibility of additives. 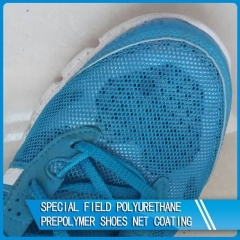 Description Special field polyurethane prepolymer shoes net coating Key features The material has excellent flowability and adhesive property, high tensile strength and tear strength. Excellent weather resistance and hydrolysis resistance. Excellent bending resistance. Typical properties Special field SPF-555 Prepolymer Appearance (25℃) Colorless viscous liquid Part A viscosity at Room Temperature (25℃) 1500±100 Part B viscosity at Room Temperature (25℃) 1000±100 Using Mixture Ratio (A：B) 100:100 Available Using Time（60~65℃/min） 8~10 Stripping Time (75~85℃/min) 10~15 Physical Properties of Finished Products Hardness (Shore A) 65±5 Tensile Strength (MPa) 24.3 Tearing Strength (kN/m) 89.6 Elongation at Break (%) 610 Application -Decorative coating of various sports shoes. Usage method -The utility model can be used for manual operation, and is more suitable for gluing machine and pouring machine. Attention The prepolymer should be stored at low temperature and dry place, avoid the moisture and moisture when used After the opening of the prepolymer should be used up as soon as possible, if not exhausted with nitrogen seal. The storage period of unopened prepolymer is three months. If you want to add color paste or other materials, keep the water content below 0.1%, and consider the compatibility of additives.